Sarah Palin's promise for a new era of government openness as the reform governor of Alaska started to crack even before Sen. John McCain's presidential campaign built a wall of protectiveness around her. Palin was elected nearly two years ago with splashy moves like publishing the state spending checkbook online. She kept a campaign pledge to allow the public to view online communications between state officials and potential bidders on a major gas pipeline, a contrast to her predecessor. But her administration has claimed broad exceptions to Alaska's freedom of information rules to keep government e-mails secret, and it's shown reluctance to disclose documents about sensitive topics, ranging from polar bears to policy issues. And her state's online checkbook is limited in its detail. Disclosures about private e-mail accounts used by Palin and her top aides have raised questions about whether they were trying to evade disclosure under the state's public records law. Her aides have denied this. Alaska's attorney general, appointed by Palin, determined in August that any personal communications on state-reimbursed cell phones and BlackBerrys can be kept secret under the Public Records Act. That could sweep information from public view if it were deemed personal, although the attorney general said state officials or courts still could review the records as needed. For citizens or journalists seeking public records in Alaska, the government generally must provide copies of records upon request within 10 days. The Associated Press has received some documents it sought in as little as one day. But when the AP asked for documents about nursing homes last June, state officials initially demanded $5,000 in fees. The fee was only waived three months later and the request satisfied after the AP printed a story on how state officials had effectively turned over questions about Palin's record to members of the McCain political campaign. Alaska now charges $960 per e-mail account for searches, plus additional fees for copying. Like Palin, McCain has promised to set new standards for transparency and accountability. Before becoming governor, Palin resigned from a state oil and gas board where she said confidentiality rules prohibited her from publicly discussing ethics problems she encountered and reported internally. Now Palin is dogged by accusations of stonewalling in a home-state investigation into whether she pressured officials to fire her former brother-in-law, a state trooper. After initially promising to cooperate, Palin challenged the lawmakers' impartiality. The results of that investigation are expected to be made public as early as Friday. "As soon as the heat comes on, the openness and transparency goes away," said Anchorage Daily News editorial page editor Matt Zencey. At a campaign rally, Palin described her state's online checkbook and said she would "bring that kind of transparency, that responsibility, and accountability" to Washington. But the U.S. government already has a more in-depth public accounting system, a result of legislation sponsored by Democratic presidential nominee Barack Obama and co-sponsored by McCain, Palin's running mate. The site, USASpending.gov, offers details about federal contracts, loans, grants and insurance payments. Alaska's Online Checkbook provides little detail beyond the vendor and amount spent, such as money spent on travel. Citizens must separately submit a formal public records request to learn who traveled, the destination and travel purpose. Even while Palin ditched the prickly press relations of her predecessor, Frank Murkowski, her staff complained about TV crews waiting to question people outside her office. Longtime state Capitol reporter Gregg Erickson said there were early signs she wouldn't meet the high bar of openness that she had set for herself. Palin asked Erickson early on why he had to sue an earlier administration to get public records. "I told her the reason governors keep it secret is they find it lots easier to govern if they can control the flow of public information. That seemed to stun her," said Erickson, editor of the Alaska Budget Report newsletter. "It's a principle she certainly discovered. Within a few weeks we were running up against difficulty," he added. He described a set of heavily edited records that he only received in full after appealing on legal grounds. Alaska lawmakers found Palin secretive about her budget plans, and they were angered she didn't signal her vetoes before axing projects they supported. "The problem is, she campaigned on being open and transparent," Democratic state Rep. Beth Kerttula said. "She says she's open but the reality with the budget is, the goals she did lay out didn't seem to be followed." A University of Alaska professor, Rick Steiner, spent months working to obtain reports by Alaska marine mammal experts that didn't mesh with Palin's opposition to the federal designation of polar bears as a threatened species. Steiner was told variously that he had to be more specific in his request, that the information didn't exist, that he could find it on a state Web site, and finally that it was protected by a "deliberative process" provision under state law. 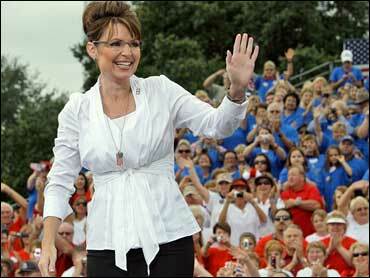 Palin made her name as a reformer when she ferreted out e-mails of a state official she suspected of wrongdoing. Back then, she said withholding such information violated her beliefs as a public servant. Now Palin's aides are withholding swaths of e-mails exchanged among her and top staff that critics and news organizations have sought under the Public Records Act. Some were sent to Palin's husband, Todd. "It's incumbent on the government to explain why these communications should be treated as confidential if outsiders are included," said John McKay, a First Amendment lawyer in Anchorage. Any messages about official business are public records, but the state e-mail servers capture them only if at least one party uses an Alaska state e-mail address, said Kevin Brooks, deputy commissioner of administration. Palin has been careful to send copies of official e-mails to at least one employee's government address so they would be retained, spokeswoman Meg Stapleton said. She said Palin used a private e-mail account to avoid conducting personal business using state equipment. Former Alaska Gov. Wally Hickel once fled an elevator to avoid a reporter's questions, but Palin invited Bob Tkacz, a business freelance reporter who covers Alaska government, for a chat when he staked her out this summer. That didn't mean she spilled the scoops. "She's a nice lady," he said, "but when she doesn't want to say something it's very hard to get anything out of her."